Secrecy has long been an ingredient in Coca-Cola’s marketing magic. By making a show of closely guarding the soda’s recipe, for example, the company cultivated a mythical status for it. Coke, then, isn’t just a beverage, but a fixture of the imagination. Could a similar strategy explain why the @CokeZero Twitter account is locked? When a person turns their Twitter account private — allowing only individually approved followers to see their posts, and removing the option to retweet — it could be the result of sustained harassment, or in order to share sensitive content, or a measure of discomfort with wider exposure. When a brand that’s only online to push their product locks the timeline down, you have to wonder why. What could @CokeZero be saying behind this veil of confidentiality? Are they in a battle with some troll army? Maybe the social media team is having a nervous breakdown. That was @MashAllPotatoes’ joke, anyway. To clarify: Nobody was tweeting angrily from the @CokeZero account. That first screenshot was faked, as the official @CocaCola account was quick to assure any current or potential customers. We did not produce this altered image. Please follow @CocaCola for official updates about #CokeZeroSugar. Nevertheless, the second screenshot is real. 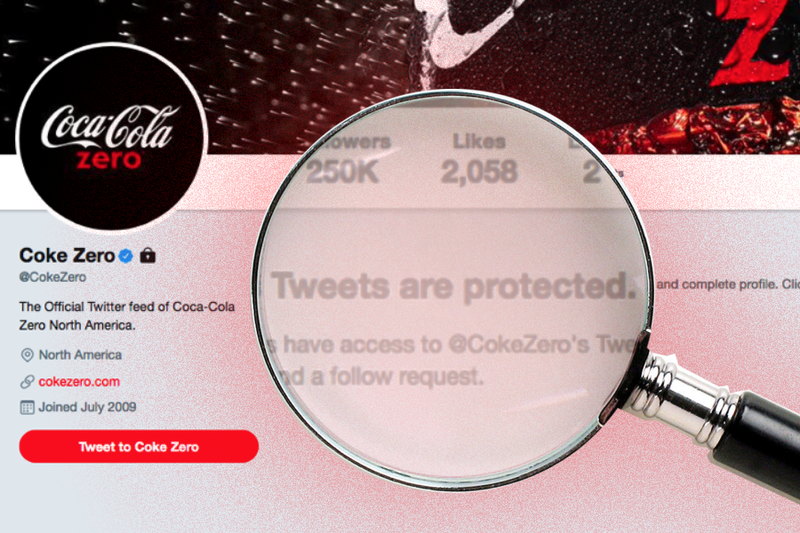 The @CokeZero account is private. The simplest explanation for the lock is, not coincidentally, also the most boring: Coca-Cola in mid-2017 announced that Coke Zero was getting a makeover and updated name — Coke Zero Sugar. The recipe tweaks involved only the proprietary blend of “natural flavors” included in the soft drink, so the change isn’t reflected on nutrition labels. Nevertheless, Coke Zero has been gradually phased out and replaced by “better-tasting” Coke Zero Sugar. Ergo, no need for a dedicated Coke Zero account. Except a quarter of a million users still follow @CokeZero (no, I don’t understand it either), and I doubt Coca-Cola loves the idea of scattering them to the wind by pulling the plug on the account. Another wrinkle is that whoever snatched the handle @CokeZeroSugar, where you’d expect the company to tout the revamped diet soda, has been suspended from the site. As we’ve seen, any Coke Zero Sugar promotion comes from the main @CocaCola feed. My guess is that some joker was squatting on @CokeZeroSugar, either posing as an actual representative or dishing out the kind of extremely toxic garbage it takes to get kicked off the platform, and left Coca-Cola with the option to buy him out or use an existing account to talk about Coke Zero Sugar. Yet @CocaCola has barely advertised Coke Zero Sugar. Almost every tweet that references it is in reply to someone confused by or curious as to the switch from Coke Zero. (It doesn’t help that Coke Zero had no sugar to begin with.) That weird urban octopus character above is the lone attempt from @CocaCola to drum up interest in Coke Zero Sugar. So we’re back to wondering if the locked @CokeZero account has taken up the Coke Zero Sugar cause — but only in view of the chosen 250,000 fans. I myself submitted a follow request, but it’s yet to be approved and perhaps never will be. Here’s where I’m going to get paranoid on you. Yes, the supposed “New Coke” conspiracy — our collective suspicion that Coca-Cola diabolically changed their formula in the mid-1980s only to create an outcry and renew our love for the classic version — has been debunked. I don’t expect them to backtrack from Coke Zero Sugar to Coke Zero to appease whichever segment of the market misses the original. In the past few years, however, we’ve seen brands adapting their approach to a fickle and irony-poisoned internet. Already, many have realized that earnest, straightforward publicity is likely to be ridiculed, or worse, ignored by the cynical natives of this ecosystem. That’s why Wendy’s started getting into roast battles with McDonald’s and Netflix is teasing us with embarrassing viewer data: when trolling customers and one another, they sound a lot more like your friends than industrial giants, bettering the odds you’ll hang out and engage with them in a playful (which is to say profitable) manner. A locked corporate account takes that idea to the next level. It sets your brand apart from every competitor on the platform. It feels like a rogue, singular action. Again: what are they saying on the other side? Is it too wild or risqué for public consumption? I highly doubt it, but that hint of mystery — as with the allegedly top-secret Coke recipe — is attractive. The privacy setting also prevents you from seeing who currently follows @CokeZero, making this demographic into an underground cabal of sorts. Imagine if other franchises followed suit, forgoing the obnoxiousness of paying to promote tweets, which inserts the content into users’ feeds against their will, and instead withdrawing into cultish seclusion, a walled garden where the haters can’t endlessly clown on them. No longer would they interrupt and dilute the social media experience; they’d be tempting users to seek access, become a member, discover the brand independently. I’m sure I’m giving Coca-Cola too much credit with this theory. Yet I can’t shake the premonition of a shift toward the aura of stealth and exclusivity. To go truly viral has always been a matter of organic, off-the-grid appeal — the kind you can’t get from a commercial or sponsored post. For all we know, this could be an ad department’s path to a more authentic vibe. Or, at the very least, an authenticity that disguises its artifice.